Gum Health: This may involve the use of special brushing methods, flossing, tooth picks and small "bottle" brushes. Some gum treatment may be necessary. The bone used in these situations may be specially treated donor material from a 'Bone Bank,' a synthetic substitute, or taken from areas in the mouth where there is some spare. In special cases where larger amounts of bone are needed it is possible to move bone from other places such as the hip or shin to the deficient area of the mouth. The area from which the bone is taken will regroup. Where the clinical conditions indicate that bone grafting is required to increase the amount of bone into which implants are placed it will generally increase the time taken to complete treatment. Under routine circumstances where no bone grafting is required the implants are commonly ready to begin function between 3 and 6 months later. If the bone grafting can be undertaken at the same time that implants are placed, treatment is more likely to take 6 to 1 2 months. Where implant placement must be delayed until after maturation of the bone graft, overall treatment may take 1 2 to 18 months. A technique call 'guided tissue regeneration' has also shown considerable success where the amount of bone at the intended implant site is less than ideal. The basic principle behind 'guided tissue regeneration' is that placing a special membrane over the extraction socket creates a layer above which the fast growing soft tissue cells are prevented from entering the bony socket. This allows bone cells present beneath the membrane the extra time they need to fill the socket without competition from soft tissues to occupy the same space. It is very common to find that the softer bone in the area above the upper back teeth (molars and sometimes premolars) is very shallow and not suitable for normal implant procedures. To solve this problem a procedure knows as a 'sinus augmentation' or 'sinus lift' was developed. Bone may be successfully grown in the sinus spaces above your upper back teeth allowing implants to be placed. Specially treated donor bone from a 'Bone Bank,' synthetic bone substitutes, or bone from other areas of the mouth or body is placed into these empty areas. Over a period of time this is replaced by new bone thus providing a bed into which implants can be fixed. lmplantology is a rapidly advancing science. We may take advantage of some of the new procedures or materials as they become available if they promise to significantly improve the outcome. Alterations to your original plan may therefore be made during your treatment. Success depends on your body's reaction to implants and your personal care of them. 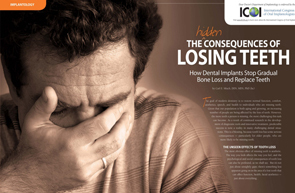 Implants can fail due to gum disease just as teeth do. Success is constantly improving due to improved techniques. Natural teeth last longer today as awareness of the need for looking after them becomes more accepted. 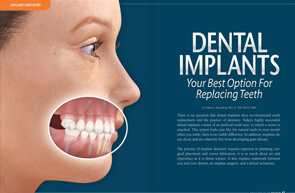 However, there would not be a need for implants if teeth were totally successful. "Success rates for implants now compare very favourably with all other forms of dentistry"
Both smoking and heavy alcohol consumption reduce the survival of implants (and teeth). If you think that either of these two habits could be a problem for you and your implants, it may be advisable to avoid this form of dental treatment or accept the higher risk of implant failure.